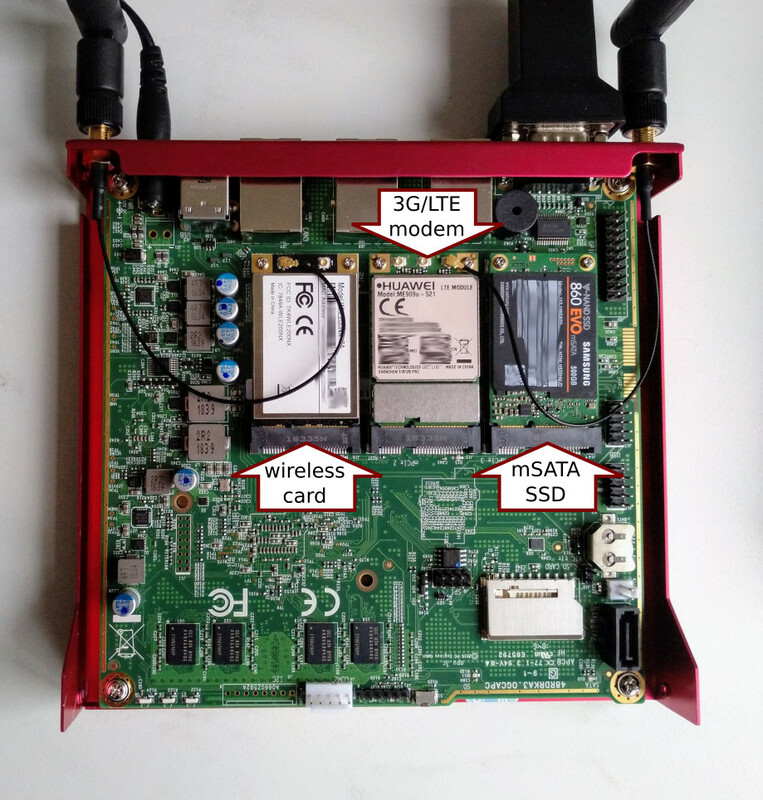 How I built the router I use at home, from hardware to configuration. The finished router. 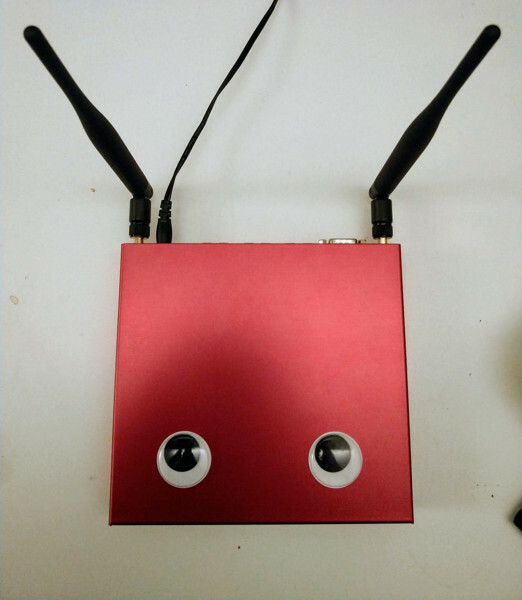 Clearly, the most important thing about a router is support for googly eyes. I used a PCEngines APU3, because PCEngines hardware is great, because it is passively cooled, because it has all the connectivity/expansion I want, and because the cases look awesome (see above). I also got one of their wireless modules and a pair of antennas + pigtails, and the nice aluminium case. I added a 3rd party SSD and a 3G modem. If you don’t need a large SSD, it is possible (and cheaper) to boot from an SD card. You really shouldn’t bother with 3G unless you know you want to. The modules I added to the APU. Note that for my use case I connected one of the antennas to the modem. Because my wireless card is 11g only, I actually only need one antenna for WiFi. I decided to use the other antenna for 3G, because, conveniently, it is there. I will replace it with a proper 3G antenna (so, 2.1GHz instead of the WiFi’s 2.4) once I get one. In the meantime, this setup works surprisingly well. In case only one antenna is used for wireless, it should be connected to the first connector (so, 0 if they are labelled 0 and 1, or 1 if they are labelled 1 and 2). This 3G modem has 3 antenna connectors, and according to its datasheet these are ‘M’ for “main”, ‘G’ for GPS, and ‘A’ for “auxiliary” (¯\_(ツ)_/¯). The antenna should be connected to “main”. I chose to use FreeBSD and configure it as a router “by hand”. If you’d prefer to use a ready-made solution which can be configured using a web interface, but still has the full power of FreeBSD underneath, pfSense is a great option. I used a USB stick (FreeBSD-12.0-RELEASE-amd64-mini-memstick.img). Booting it over network also works. The APU’s baud rate is 115200 (PCEngines). One of the many options for opening a serial console: cu -l /dev/ttyUSB0 -s 115200. Then type boot to boot. I got a 500GB mSATA SSD because it was kinda cheap and I want to do more than just routing. Therefore, I installed with root-on-ZFS because it shouldn’t eat that much RAM with just one disk and ZFS is awesome. After installation and with everything set up, I am using only about 400M of memory and a quick dd conv=sync test shows write speed of 280MB/s, so it appears that the system is happy with ZFS. I did not create a non-root user because my config management takes care of that. Test with ppp -background u3g and see if it works. Modems are magic, but actually unless you need a username/password or SIM PIN, this should Just Work because the network provider provisions settings like APN. Modems are evil and might not work after a reboot because they haven’t been sufficiently power-cycled. Mine does that. Workaround: Pull out the power cable for a few seconds instead of a soft reboot. I used dhcpd as my DHCP server (pkg install dhcpd). You probably also need to add ifconfig lines for your wired interfaces, and probably bridge some things. I didn’t bother, as none of my usual devices have an Ethernet port, so if I end up using those wired NICs, I’ll configure them separately. ifconfig_wlan0="inet 192.168.0.1/16 mode 11g channel 3 txpower 7"
Things I haven’t done yet but want to in the future. I need to get IPv6 connectivity (via an OpenVPN tunnel, as my provider doesn’t offer native IPv6) and then also enable IPv6 on my wifi. I want to have all the configuration in ansible (using my BSDops) and thereby make it completely trivial to reproduce my setup. That is not quite the case yet. While this is only one config file and I could just do it immediately, I’ll call it “blocked” until I have the above, because I want that config file to be templated and managed by bsdops. My wifi has some devices that I might not want to expose to everyone who visits my flat. Having two SSIDs, one of which I don’t share, would simplify access control. Once I no longer live on 3G: Use link aggregation to seamlessly failover from ethernet to 3G and back. Make SCION runnable on FreeBSD and become one of the first households with native SCION connectivity.